Claire Scanlan is launching a new life and a new career in real estate. She has a chance to sell a spectacular house but, as the site of a mass murder, the property is not attracting buyers. When Ben Grant, the handsome brother of one of the murder victims, shows her the empty house Claire experiences strange sensations that are both fascinating and repellent. Claire is also fascinated (and not at all repelled) by Ben Grant. But if Claire accepts her new-found paranormal power as real, she must also accept the responsibility for solving a bloody crime--even though Ben seems to be a prime suspect. 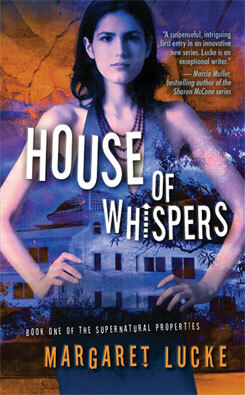 Margaret Lucke is the author of House of Whispers, first in a series of paranormal romantic suspense novels from Juno Books. (Her personal Web site is: www.margaretlucke.com.) Her earlier novel, A Relative Stranger, was nominated for an Anthony Award for Best First Mystery. A former president of the Northern California chapter of MWA, she teaches fiction writing classes and is an editorial consultant for businesses and individuals. 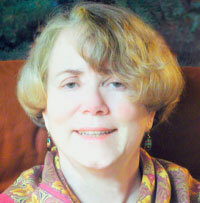 She has authored two how-to books, Schaum's Quick Guide to Writing Great Short Stories and Writing Mysteries, as well as short stories, feature articles, and scripts for mystery weekends. Lucke lives near San Francisco in a house that she shares with a husband, a cat, and various wilting houseplants. She enjoys black tea, red wine and dark chocolate. Margaret Lucke says she has been "flinging words around for most of my life, as a writer, editor, communications consultant, teacher of writing classes, and writing coach." Writing fiction is her first love. "Ever since I produced my first book at age five (I still have the one and only copy), I've been fascinated by the power of stories and the magic of creativity." The "Supernatural Properties" series (admittedly, the nameis a bit of a pun) is, she explains, "on one level, a fancy way of saying 'haunted houses.' Claire Scanlan, the central character in the series, is a real estate agent who comes to make a specialty of selling problem properties--places that are difficult to sell because they are beset by paranormal phenomena. On another level it refers to Claire herself. She is characterized by her own 'supernatural properties'--the skills and sensitivities that make her aware of spirits, energies, and occurrences that most people don't notice or can't understand." The property featured House of Whispers is a modern, architect-designed home overlooking the San Francisco Bay; in the second book, Mansion of Desire, a Victorian mansion in San Francisco that was once a bordello is featured. "As the series moves forward," say Lucke, "Claire may take on challenging properties in fascinating locales all over California--the wild and remote Lost Coast, the sybaritic Wine Country, the historic Gold Country with its lure of wealth, the majestic Sierra, the dazzling environs of Hollywood. Each place will lead her to a new mysterious and romantic adventure." Why are so many mysteries set in the SF area? "One reason is that it's such a colorful place. In San Francisco, though, "colorful" doesn't mean reds, greens, or blues. It refers to the region's rough-and-tumble Gold Rush history, the eccentricities of many current residents, the mix of cultures, the variety of lifestyles. It has been said that San Francisco is a city of schemers and dreamers, that people come here because they are running from something or to something. Rudyard Kipling called it 'a mad city--inhabited for the most part by perfectly insane people...' What writer couldn't find great plots and characters in a place like that?" Lucke feels writing mysteries offers many challenges and satisfactions. "Mysteries demand that I tell a good story and create a challenging puzzle, and in return they offer an unlimited canvas on which to explore any theme or subject that intrigues me. On the page I can have adventures and take risks that I never would in real life, and I have the power to create order and logic in what is really a disorderly, capricious, and confusing world. In a mystery, I can unveil the secrets, discover the truth, and make justice prevail." But with Claire Scanlon, Lucke also had the task of inventing a chracter with paranormal powers. "One challenge was to understand what those supernatural powers are. What can the character do, and what can she not do? There are many kinds of paranormal powers, in the same way that there are many kinds of artistic abilities. Just because someone can, say, perform magic, it doesn't follow that she can also read minds, any more than you can expect a gifted musician to produce beautiful paintings. "Another challenge is to figure out how her powers, and any paranormal phenomena in the story, might work. We understand that the physical universe operates by laws of physics. Similarly, the supernatural world must behave according to certain rules. Readers are more willing to suspend their disbelief when the writer brings them into a story world that seems consistent and logical, even if the logic differs from what we're used to." Lucke is currently busy writing her second Supernatural Properties novel and researching a third. "Research" may involve spending some time visiting its locale: California's beautiful, isolated "Lost Coast". "I love to travel," says Lucke. "My writing career has given me chances to visit Hong Kong, Singapore, Thailand, England, and Italy, as well as Alaska and other U.S. places. Most days, though, I journey no farther than my desk--and into my imagination."